Yesterday we watched a couple of games in Mackey Arena. The first was an alumni basketball game that featured players from last years squad all the way back to a fan favorite player from 1966. The second game was a three part scrimmage featuring this years squad. It is always fun to see the freshman for the first time. They did not look too bad either so the prognosis for this year might not be as bad as the experts think. The photo that I chose for the game was this wide angle shot from the alumni game. I had my 70-300 on for most of the game, but I had to take it off to get a picture of our group. Since I was changing lenses anyway I decided to get a couple of wide angle shots. This one shows former Boiler Travis Best launching a three from the corner. I really like the wide angle shots of the bigger stadiums. This post was easy to title because Mackey has no air conditioning. I am sure that the gym gets hot with no fans in the seats, but put about seven thousand there, and you get a hot time. I enjoyed watching the alumni play though so I think that I would be back if they do it again. I thought that one of my favorites from the past, David Teague, had iced the game with a three pointer at the end. Little did I know that Lewis Jackson still had two threes up his sleeve including the game winner with no time left. The game was all fun until the end when you could tell that both teams really wanted it. A great ending to a great affair. This shot was edited again with my iPad using the Snapseed program. My computer can be maddening at times with how slow it is. So to get around that I don’t use the programs that I spent a lot of money on. Instead I use Snapseed which was $0.99 cents at the app store. I actually processed this picture on the way to dinner last night while in the car. If not for the rainbow it would have been the photo of the day. This was then pushed back to today to allow both pictures to get some views. 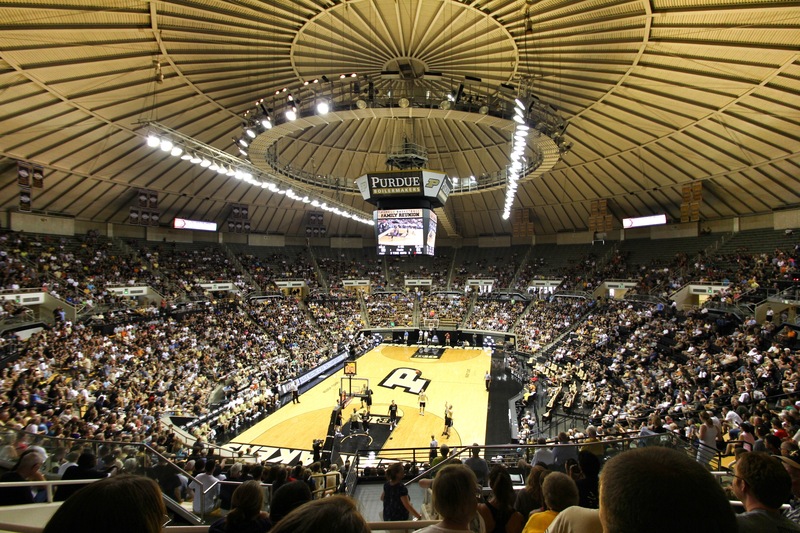 A picture and some thoughts from the festivities inside Mackey yesterday.